The sleeves comes in two colors, black and white and are left/right leg specific. As mentioned above this sleeves are very slick and light weight. The sleeves material breaths well and transport moisture away from your skin. 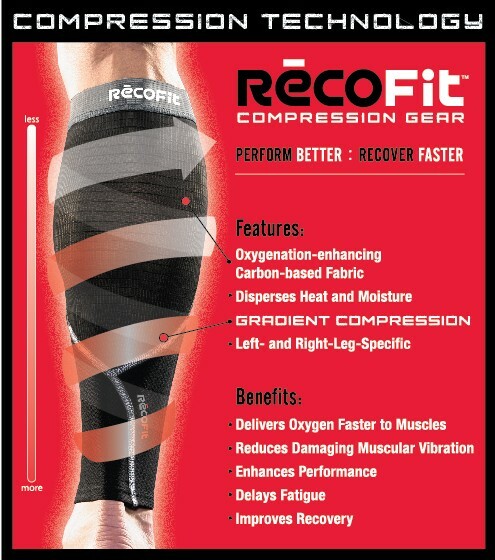 Recofit has paid attention to other sleeves downsides by adding features such the way of secure the fit. Recofit has added a loop of spandex at the top of the sleeve, this feature secure the fit and the sleeve stays up during all my runs.This will be my choice of sleeves on race day due to its light weight and breath ability. Recofit looks fast and they feels fast. Recofits sleeves are by far the best sleeve when it comes to the performance of the race day for those reasons. Great lightweight breathable sleeve with nice compression and a secured fit. A sleeve for the race day. Got here while searching for compression sleeve reviews. Thanks for sharing! I am using CompressionZ calf sleeves and they give me great leg support. I actually use them at work since I am always standing up most of the day. I feel less tired when I have the sleeves on. Thanks, I have not tired CompressionZ but been using most brand with great success. Recofit is my to go sleeve for race days. Very light weight with great support.